254 pages | 27 Color Illus. | 70 B/W Illus. As the human population grows from seven billion toward an inevitable nine or 10 billion, the demands on the limited supply of soils will grow and intensify. Soils are essential for the sustenance of almost all plants and animals, including humans, but soils are virtually infinitely variable. Clays are the most reactive and interactive inorganic compounds in soils. Clays in soils often differ from pure clay minerals of geological origin. They provide a template for most of the reactive organic matter in soils. They directly affect plant nutrients, soil temperature and pH, aggregate sizes and strength, porosity and water-holding capacities. This book aims to help improve predictions of important properties of soils through a modern understanding of their highly reactive clay minerals as they are formed and occur in soils worldwide. 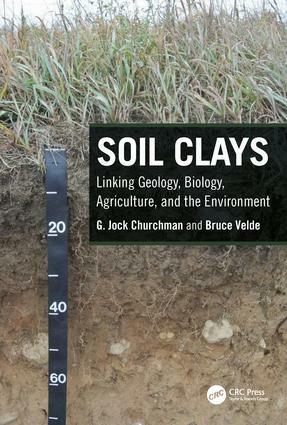 It examines how clays occur in soils and the role of soil clays in disparate applications including plant nutrition, soil structure, and water-holding capacity, soil quality, soil shrinkage and swelling, carbon sequestration, pollution control and remediation, medicine, forensic investigation, and deciphering human and environmental histories. To know soil clays is to enable their use toward achieving improvements in the management of soils for enhancing their performance in one or more of their three main functions of enabling plant growth, regulating water flow to plants, and buffering environmental changes. This book provides an easily-read and extensively-illustrated description of the nature, formation, identification, occurrence and associations, measurement, reactivities, and applications of clays in soils. Introduction. Soils: Definition and Range. Origin of Soils in Geological Time. Soil Science. Clays Definition: Silicates and Oxides. Ideal Basic Structures. Soil Clays vs Type Clays. Prospects of Soil Clays. Explaining Useful Properties of Soils for Agriculture and the Environment. Formation of Soil Clays. Factors in Formation: Rock Minerals. Biology and Organic Matter. Climate. Ease of Drainage. Anthropological. Driving Forces for Alteration and Transformation of Rock Minerals: Physical, Chemical, and Biological. Alteration of Rock Minerals in Lower Horizons of Soils. Transformation of Clays and Formation of New Clay Minerals in Alterite Zone. Occurrences of Soil Clays. Extraction and Analysis. Inorganic Interactions. Reactions with Organic Matter. Effects of Soil Clays on Applications: Agriculture and Environment. Prospects for Explaining/Predicting Useful Soil Properties from their Soil Clays. G. Jock Churchman is Adjunct Senior Lecturer in soils at the University of Adelaide and Adjunct Associate Professor at the University of South Australia. He obtained degrees in chemistry from Otago University in his native New Zealand. He studied the physical chemistry of halloysite for his PhD under a fellowship from the New Zealand pottery and ceramics industry, and carried out research for this industry for a short time before beginning a 2-year post-doctoral fellowship in soil science at the University of Wisconsin. He has continued trying to understand why halloysite contains interlayer water (his specific PhD thesis topic) his entire career, while pursuing many other research topics on clays, especially in soils. He has special interests in the physical chemistry of clays, clay–organic interactions and soil microstructure, the philosophy of soil science, and clay genesis. Bruce Velde,born 30 November 1938 in Chicago, Illinois, obtained a BS from the University of Illinois and a PhD from the University of Montana, and was awarded a post-doctoral fellow at the Carnegie Geophysical Laboratory, Washington DC, from 1962 to 1965. He entered the French Centre National de la Recherche Scientifique in 1965. He became Directeur de Récherche in 1982 and now has emeritus status as Directeur de Recherche Emérite Laboratoire des Sciences de la Terre, Ecole Normale Supérieure Paris. In this position he directed 22 masters and PhD-level theses, and published 233 reviewed articles and 8 books. His research interests centered on the stability and genesis of clay minerals under various geological conditions. His current interest is in the dynamics of soil clay materials and plant–soil interactions.